Trains have now joined buses in providing real-time data showing whether they are running on time. 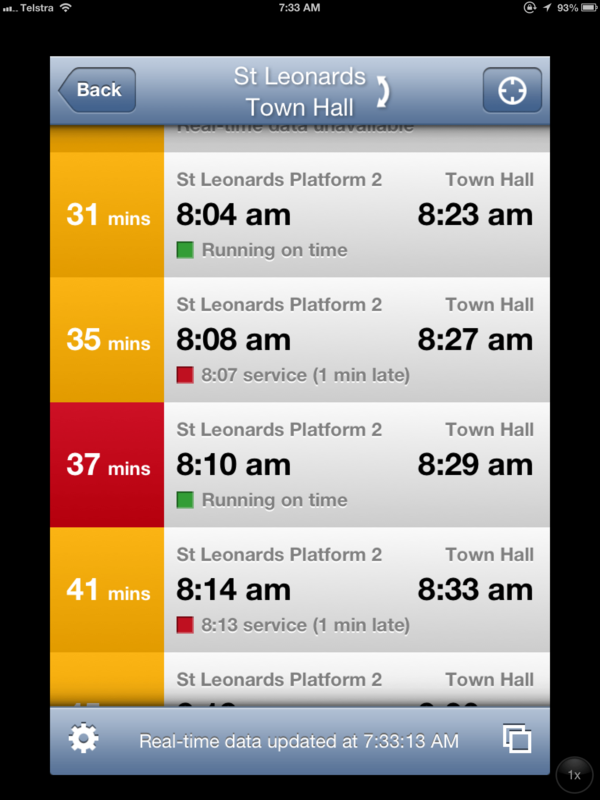 Although I love being able to see if my bus is running on time, I’m not convinced the train information is as useful. But that could well be because I have the luxury of living in an area where trains are plentiful and frequent. If the train only came once ever 30 or 45 minutes, being able to see whether I would have to wait would be a real boon. In any case, I think anything which provides more information has to be a positive step and should be welcomed. Next on my wish-list is Google Maps and 131500 providing real-time data part of their services. There really remains no good excuse for 131500.com.au, in particular, not having this incorporated into their offering. The apps are: TripView, TripGo and Arrivo Sydney.